One of the main delights of catching the Chicano Visions exhibit currently running at the M.H. deYoung Museum in San Francisco, was discovering Steve Barretto's Brown Jesus in the museum store. My bud Tavo Hernandez bought the t-shirt for me and I proudly wore it to my interview with the Quinceañera team. Jesse Garcia, especially, was taken by it so I contacted Steve to see if he would be willing to comp Jesse a t-shirt and he generously obliged. His generosity of spirit intrigued me so I asked if we could have a chat. We met in his office at the base of Potrero Hill and sat outside on a rooftop deck to discuss the Brown Jesus campaign. I came with a copy of Entertainment Today which featured my Quinceañera interviews and my own shout out to Brown Jesus. Blanched by years of misrepresentation, Brown Jesus is the ultimate branding campaign by Barretto-Co. Recognized as a work of excellence by the American Institute of Graphic Arts, Brown Jesus is in their permanent archive. More than a campaign that rewrites or recontextualizes history, Brown Jesus effectively exposes false history and reclaims accurate representation. Michael Guillén: Steve, can you give me a little background on yourself, your training, and the inception of your business? Steve Barretto: Absolutely. I trained formally as a graphic designer down in San Jose. I worked in several small studios, and middle-sized studios, and ended up working at Apple Computer. When I left Apple in 1989, I started my own business. My own business has transformed over the years. Barretto Co. recently incorporated in 2004. I've been working with nonprofit and for profit clients since 1989. MG: Helping them develop brand name; is that how you sell yourself? SB: It's marketing communications and that involves graphic design at all the different levels. A lot of that has been put under the umbrella of "branding" recently, right? That's the industry-speak. MG: Could you define "branding" further for us non-industry folk? SB: Sure. "Branding" I find to be a strange name actually for what we're doing because historically I think branding's sort of a strange practice, to claim ownership, right? But the way that we use it in our industry, it involves all the aspects of how you put a face on an organization or a company. That includes writing, images, and how those words and images go together with design. Design seems to be the element that ignites passion for brand. Words alone are tough. Images alone are tough. 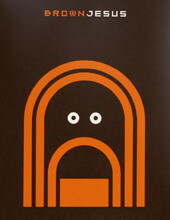 But when you find the right mix of word and image, you can really compel somebody or have an image with words resonate. MG: So it requires an intertextuality? You have to have image and word for it to be branding? SB: For the most part, right. A brand is expressed in every business transaction that occurs that involves communication—from the receptionist picking up the phone and having a dialogue with the prospect or customer, to the way that you receive your monthly invoices, to logos, to advertising, packaging—all that makes up a company's brand. I've been doing this for clients for years—for Fortune 500 companies and really small mom and pop companies—and always wanted to do personal work. In the process of creating these people's identities or brands, I do a lot of sketching and one night—while I was working on a sketch for a client—I drew this [shows me a sketch]. It started off with the two archs and the little arch beneath it and then I thought, "This looks like something very familiar to me." I was raised Catholic in the Bay Area. The war was just happening, it was 2004, and there were lots of images of longhaired men with beards and moustaches and I thought, "Hey, there's something here to this image." So I put some eyes on it and it started to look like … well, it was definitely recognizable for me. And then it needed a name. So, growing up Catholic in a world where I was one of four kids who was a minority in a Catholic school, I've always had an issue with the fact that Jesus has been portrayed as a Caucasian person and so I said, "This is my chance here." My chance to reclaim what was most likely the color of Jesus Christ's skin, which was most likely brown. MG: Not only chance but an appropriate eloquence. I recently interviewed a young actor Sirak M. Sabahat, an Ethiopian Jew, who was telling me about his life and his understandings of Christianity, and how shocked he was when he came to Israel to find out that they thought that Jesus was white because he had grown up with the image of Jesus being a black man with full lips…. MG: So when I first saw Brown Jesus at the deYoung's Chicano exhibit, I was stunned by the simplicity of the message: it's political, it's comical. I've never interviewed a designer before but I was so intrigued by the concept that it made me explore your site to see what you were doing. How did you get the gig with the deYoung and the Chicano exhibit? SB: I pursued this and I produced some silkscreen posters and t-shirts purely for my own need to publish my idea, my message, and I shopped it around to a few small boutique stores. The first store that said it had some potential was Super7 in Japantown in San Francisco. They bought a few shirts and a few posters and the next week they called me up and said, "We've sold out of all the shirts." I said, "Huh." So I gave them a few more shirts. They called me the next week and they said, "We've sold out of all your shirts." I said, "This is good." People are getting it and for those reasons exactly; it's got an edge to it, lots of undertones, you can read into it whatever you want to. One of those people who bought one of the t-shirts and the posters was Kelly Chin at the deYoung Museum; she works at the store. When Chicano Visions was on the exhibit list for the deYoung, she was my advocate there and said to the store manager and the curator, here's a local artist who isn't Chicano but he's a minority and he's got this thing that he's doing and I think it would work with the show. She called me up out of nowhere and said, "Oh, y'know, I got me your t-shirts and posters and I'm a fan of Brown Jesus"—there are these people out there who have seen it and I'm so grateful for that and she said—"We'd really like to get it in the show but I have to get it past the curator and the store manager. The store manager wasn't sure about it but the curator said something which was the highest compliment, something to the effect of, "It's too bad it's just in the store and it isn't part of the show." MG: Are you Latino? What's your background? SB: No, my folks are from Hong Kong and Macao so I am of Portuguese descent with Cantonese and lots of mixed cultures over there. MG: All the more fascinating that this issue of representation—which was an issue for you—crosses across ethnic lines to address the question and groups minorities together into a larger majority. MG: I begged for the t-shirt because I didn't have any money and I was with friends and I said, "I've got to have this t-shirt." They pulled together…. SB: They ponied up for you? MG: They ponied up for me so I was really appreciative. MG: I was especially glad that Jesse Garcia was so into the t-shirt when I interviewed him and that Entertainment Today included my plug in the interview (you never know what they're going to edit out). I'm hoping that, if Jesse wears it, it will provide some good exposure for you in the Los Angeles area. SB: I want it to resonate with people. I'm not in it for the commercial aspect; I'm in it for the awareness, really, for all those reasons. MG: So the Brown Jesus t-shirt, the posters, the buttons, are being sold through the Barretto Co. website but your business is much much more than that, right? SB: My business is a service business for clients who are looking to tell their stories to their audiences in more effective ways and that involves designing-writing. MG: So the product that you have on the website, this is more your personal creative expression? MG: Brown Jesus, Babies Not Bombs, Spare the Air, these are all messages that you're trying to get across through this particular medium? MG: Oh yes, yes, yes, I know his work. There is a strong articulation that can come across in a simple image and a simple word. SB: A simple word, exactly. When it can be read at many levels, it's really effective I find. 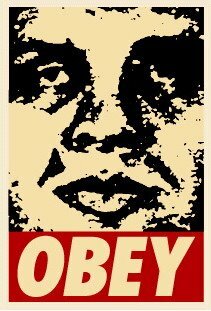 Even [the Obey Giant campaign] is not so clear. Anybody can take this graphic and this word and interpret it in different ways. With the Brown Jesus thing there's more of a reclaiming of what was probably historically true instead of creating something new from nothing. Brown Jesus is reclamation. MG: Where do you hope to take it? SB: I don't know. I feel the need to talk with other artists and people who understand how to push something like this to have it be accessible as a—not a movement, necessarily—but just as a cultural…..
SB: A cultural icon, yeah, and really pervasive. SB: It's a clothing line. MG: It's everywhere. So I imagine that's where you're taking Brown Jesus? SB: I would hope to, I just don't know how to get there. That's where I really need some mentors and peers to talk with to come up with creative ideas of where it could go. MG: Within your career field, have other designers provided input? SB: Not with where it could go. MG: Just that they enjoy it? SB: Yeah, exactly, not with how the campaign could really take off. Just the little bit of input that I've received from emails and 50-year-old guys out in Minnesota saying, "Hey, my son sent me this t-shirt and I love it." I know that it's got the potential to spread outside of San Francisco and catch like wildfire. MG: Definitely. Well, it's in Los Angeles now. MG: Are you at The Mexican Museum? Are you in La Tienda? SB: I'm sending out postcards to folks and The Mexican Museum's one of them. MG: The Galería de la Raza? SB: No. I need to write that down. MG: Yeah, the Galería de la Raza, because they have a store where they sell a lot of product. Now, the sticky wicket—as you've already dealt with at the deYoung—is that you're not Chicano. Is this going to get in your way? But why should it? MG: In fact opening this weekend at the Galería, in collaboration with The Mexican Museum, is an exhibit on the African presence in Mexico and I think there's a burgeoning awareness of the breadth of the diaspora and what these influences entail culturally. You might want to take a peek at that. The artists are going to be there on Sunday, I think. Definitely Brown Jesus should be sold in their store. It would sell like hotcakes! I'm so excited by your Brown Jesus campaign because it's such a clean, edgy thought. When I first saw it I thought, "How did he design this? Because it looks like Jesus!" SB: Right. And he's not happy. [Laughs.] If you really look at him, he's contemplative. He's not like a smiley face have a nice day Jesus. MG: Another idea I would suggest to you is to contact Trey Parker from South Park. Brown Jesus should make an appearance on South Park. You know South Park? SB: I do know South Park and I'm a huge fan. In fact, when I did this, I thought it kind of has a little bit of the South Park feel to it. MG: It does! That's why I made that association. It'd be funny to see their Jesus meet Brown Jesus. [Steve chuckles.] You never know! Do you have any advice you would give to young designers? SB: Absolutely. This is another sticking point for me with this piece. I think that our industry—graphic design, graphic communication—there is an imbalance with people of color working in this industry. I'd love to see design students that are of different cultures other than those who dominate graphic design. I would love Brown Jesus to reach somebody who's interested in drawing as a kid and doesn't know where to go with drawing and maybe doesn't have parents who are saying, "Y'know you can make a career out of ideas and drawing." And that career would be design. So I would really love Brown Jesus to touch people who don't know that they can take their drawing into a commercial career. MG: Is college training requisite? SB: Not necessarily but it's a lot harder if you don't have it. MG: I imagine entry level positions are hard to come by. SB: Yeah. There are state programs—I went through a state program—that are affordable. It wasn't a private art school that costs $40,000 a year. You can get there with a state education and compete at the level that art school students are competing at. I don't see enough Hispanic or African-American people in graphic design in the circles that I'm in or the shows that I go to. MG: Brown Jesus would also be a great album cover. You should contact Los Lobos. You should contact Carlos Santana. They're local. You should offer it up; I bet they'd grab it. MG: I'm Hispanic, yeah. I don't look it but their causes are certainly my own. I've also been an early Christianity aficionado for many years so the issue of the representation of Jesus and its cultural/political implications has long held fascination for me. So, along with the Brown Jesus, Babies Not Bombs, Spare the Air Day, what's coming up? What's in the pipeline? SB: I think that Brown Jesus is so singular in its message and so powerful and simplified that I really want to explore this in other ways, how to get it out in a larger way, so instead of putting my energy into some other ideas, I'd rather try to see how Brown Jesus could go further. MG: Do you offer finder's fees? SB: Absolutely. See this is what I need. I need a network of evangelists and finders fees are fair. I'm all about fairness. This isn't going to become a Paul Frank. MG: Why not? I'll start working on it right away! I've often thought that I should have been a publicist, I should have been an agent, that's what I've always loved. When I find something that I like, I go after it with a passion, I want to find out everything about it and I want everyone to know about it. MG: Well, thanks. Again, I appreciate that you've taken the time out to speak with me, Steve, and I look forward to helping you spread the Word.